There are certain recipes that fall into a category I call “Louisiana Church Potluck Dishes.” These are dishes that I grew up eating regularly because they were staples at the monthly “Family Night Suppers” at the church of my youth. I remember sampling delicacies like baked cushaw, mirliton supreme, and eggplant casserole without knowing what the heck they were, but hey, they tasted pretty good. My mother had her own signature dishes, and I don’t recall her ever making any of these potluck standbys, but there wasn’t really any need–we’d have them again at the next church supper. I’d completely forgotten about eggplant casserole until a neighbor remarked that it was her favorite eggplant dish. As soon as she mentioned it, I was flooded with memories of a creamy filling covered with cracker crumbs, but I pushed it to the back of my mind because I wasn’t sure what went into it, but whatever it was, it certainly wasn’t vegan. Preheat oven to 425 F. Prick eggplants several times each with a fork and place them on a baking sheet. Bake until they are both completely soft (skin will be blackened in places and collapsed in the middle)–30 to 40 minutes. Remove from oven and allow to cool. Scoop the flesh from the skin, discarding any liquid. (You can do this step a day ahead and refrigerate the eggplant pulp until ready to use.) Set aside until ready to use. Chop all vegetables (I do each one separately in the food processor). Spray a non-stick pot with olive oil (optional, depending on the non-stickiness of your pan) and place over medium-high heat. Add the onions, green pepper, and celery and cook, stirring, until the vegetables soften, about 6 minutes. Add the garlic and mushrooms and continue to cook on medium-low heat, stirring and scraping the pan’s bottom, until the mushrooms soften, about 5 minutes. Add the reserved eggplant, chickpeas, parsley, thyme, cayenne, paprika, and black pepper. Cook, breaking up any large pieces of the eggplant with the edge of a spoon, on medium heat while you prepare the tofu mixture. Place the tofu, cashews, onion powder, and water in a blender and process at high speed until cashews are blended and mixture is smooth. You may have to stop the machine and scrape down the sides several times and, if you’re using a Vita-Mix, use the pusher to push the mixture into the blades. Scrape the mixture out of the blender and into the pot with the eggplant-chickpea mixture. Stir well, add nutritional yeast, and salt to taste. Preheat oven to 375F. Oil a shallow baking dish and pour the eggplant mixture into it, smoothing the top. Mix the breadcrumbs with the basil and oregano and sprinkle them over the top of the casserole. Bake for about 25-30 minutes, until top is browned and casserole is hot. Remove from oven and allow to cool for a few minutes before serving. Nutrition (per serving): 188 calories, 32 calories from fat, 3.8g total fat, 0mg cholesterol, 1023.4mg sodium, 727.4mg potassium, 31.8g carbohydrates, 9.8g fiber, 6.4g sugar, 10.4g protein, 3.3 points. Though MyPoints are calculated using a formula similar to Weight Watchers Points TM, this site has no affiliation with Weight Watchers and does not guarantee the accuracy of this information. I'm just cracking up at your "Louisiana Church Potluck Dishes" category…so Louisiana indeed! 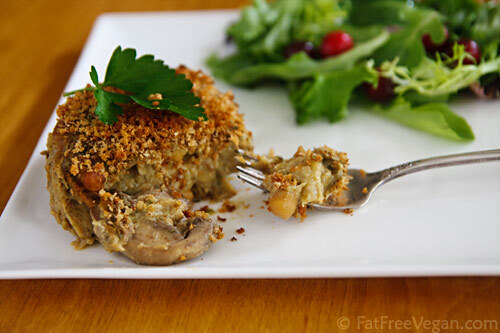 Glad to have found your blog and will be trying the Creamy Creole Eggplant Casserole recipe this weekend. Do you have a good recipe for mirliton stuffing/casserole? I'd love to try it! OMG you can eat southern and vegan. Thanks so much. I finally made this and it was so good! Looking back at the comments now though I think next time I will certainly be using the tahini instead of the cashews (maybe with a little lemon?) I have another recipe for an eggplant/chickpea dish that has tahini and lemon that is fantastic so I think that combination with the casserole aspect will be out of this world. Thanks for the delicious recipe! Made this tonight, exactly how the recipe was written. Out of this world delicious! SusanV – this was the first FFV recipe I tried and I am in love! I make it once a week now and am amazed how well it turns out each time. Thank you for sharing this delicious recipe! This sounds delicious. I love that you have chickpeas in it, and the tofu and cashews sound like they must make it creamy. Will definitely try this recipe! This recipe is insanely good. I can’t believe something that tastes this rich is actually GOOD for me. So decadently creamy! 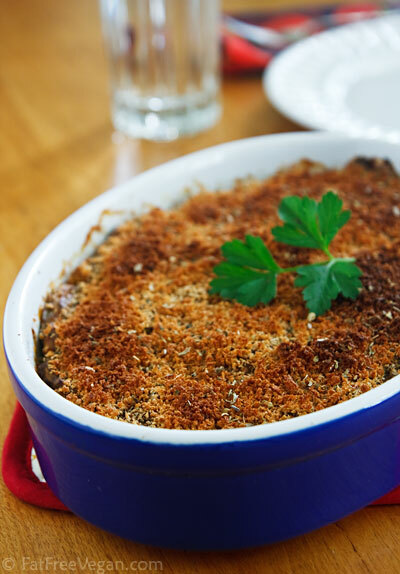 I wouldn’t have dreamt of feeding my relatives eggplant on Christmas, but I’m thinking my non-vegan relatives might like this as a side-dish at our celebration—it does have that casserole-y thing going on–and in a good way. You hit this one out of the park! This is such an easy thing to prepare though the ingredients are numbers. For me, eggplant does not taste well but with these looks of this creamy creole eggplant casserole I don’t how it will taste this time. Therefore, I’m really gonna try this one. Wish me I can do it well and to my family who’s gonna eat this good luck! I’m just kidding though. Hi, I made your Creamy Creole Eggplant Casserole. Thought it tasted much better on the stove in the pot before it came out of the oven. Thought cooking it in the oven ruined it for some reason. any ideas on what to substitute for mushrooms? i know dr. fuhrman says they are really good for you, but i just can’t get into mushrooms. Delicious! Next time, though, I’ll also increase the amount of spices, since it didn’t come out as flavorsome as expected. Oh, and I sprinkled a few sunflower seeds over the breadcrumbs, for good measure. I am from the midwest, and before seeing this post I had never heard of eggplant casserole. It looked interesting so I bought the ingredients, but I wasn’t quite sure what to expect. Having never tried any non-vegan versions of this dish, I can’t comment on how it compares to the original. What I can say is this dish blew me away with its creamy, delicious flavor. I suspect it might be even better than whatever fatty, non-vegan recipe it replaces, and I plan on making this many more times! Thank you for another amazing recipe, Susan! We had this for dinner with brown rice and spicy collard greens and it was EXCELLENT!!!! Your recipes look great. Question: what is nutritional yeast? Can I find that in mainstream grocery stores? It’s not the same as yeast one can find in the baking section, is it? This looks AMAZING! totally in-love with Eggplant (although quite novice when it comes to cooking with it to the point i almost avoid it in fear of ruining it! ). I was just wondering why it is that the skin seems to often be removed in recipes??? (I tend to leave skin on veges as i’ve heard its where most of the nutrients, fibre and all that good stuff is)….is this not the case with eggplant? or is it removed because of bad flavour? texture? etc once roasted? Eggplant skin can be tough, so I tend to leave it on when the eggplant is in chunks or thin slices and the skin probably won’t be noticeable. But for recipes like this, where the eggplant is baked first, you want only the soft, creamy middle. When it bakes, the skin gets even tougher, so it usually isn’t used. I’m excited to make this dish this weekend. What type of tofu do you recommend? Extra-Firm, Firm…? You can use any softness of tofu as long as it’s the silken tofu in the aseptic package. I used firm. This sounds so delicious! I can’t wait to try it out! I was going to make PPK’s eggplant moussaka today, but when I saw this recipe, I decided to make this instead and can’t believe how delicious it is!!! It will be on the menu often. Especially when I have eggplant in the garden. 🙂 I used the japanese eggplant. A little more work, but definitely worth it. I really love the creaminess inside, the texture of the garbanzos and then the crunchy breadcrumbs on top. I ate this with a salad and I’m a happy camper right now. 🙂 Thanks again, Susan, for another super-duper delicious recipe. I broke my camera a while back and just got a new one (nothing like yours) *smile* so I’ll be blogging about the gem of a recipe. I hope you know how much you’re appreciated!!! Thank you so much for creating this awesome recipe! It’s my favourite casserole (and I eat lots of casseroles) and therefore had to be my birthday dinner. I can’t get over how creamy it is with such a lot of great and healthy ingredients. Sure, it’s a bit time-intense but it’s well worth the effort. Also, it’s easy to sub ingredients: I don’t like bell peppers so I used kabocha squash instead and seeing as I don’t ever have breadcrumbs on hand I subbed – don’t knock it ’till you try it – puffed amaranth (unsweetened). Such a fun, crispy idea. Just something random I’ve been wondering: Do you still enjoy this recipe yourself? I assume as you’re coming up with new recipes all of the time others might be left aside. Maybe you could do a post on which are your favourites from the ones you created? I hope this isn’t a stupid question/idea. Hi Susan! This looks amazing and I cant wait to make it. I do have 2 questions. I really don’t like mushrooms and lord knows I’ve tried I just can’t seem to acquire a taste for them. Do you think the recipe would suffer without them or do you have a recommendation for some thing else in its place? If not I’ll just give the shrooms another try :-). Oh one more thing… I noticed the sodium is quite high. Where is that coming from? I don’t have issues with salt but I just try to be conscious of how much I take in daily. Love your site! It’s been a huge help to me as I’ve just recently adopted the vegan way of eating and have learned much from you!!! Christina, I think you can just leave the mushrooms out with no problems. About the sodium, it’s mostly from the salt, but using canned chickpeas that contain salt also contributes. Thanks Susan! Wow, that little devil (salt) really sneaks up on ya! Lol. Ok can’t wait to make this…..hopefully next week when I shop again. I will let you know how it comes out. Susan…..I bit the bullet and made it with the mushrooms! I didnt want to change your recipe. I LOVED IT! By far my favorite! There is so much flavor packed in this and I’m all about spice….love spice. Tofu? I have never used it or at it in my life…..why? It was great!!!! I am very new to vegan diet and you have no idea how helpful yor site is! It showed me variety and flavor that I didn’t know existed on vegan. I honestly think without finding your site I would have thrown in the towel for cheese. Now that I realize creamy flavorful dishes like this can be made I a happy woman!! It was amazing recipe!! My family loved it!!! I became vegan a moth ago, and I started searching for some websites, and I found this website. My husband and I read it and we like it. Thank you Susan for all the information that you are posting, we are getting more information and knowledge about being vegan. I made couple recipes and my little one love them. Thanks and God bless you! I adore this blog and I’ve been using it to plan more and more vegan meals for the family each week. So far, my husband has put up minimal fight regarding the lack of meat…until I made this. Only one of my three kids liked it and I only loved the flavor, but the texture was downright unbearable. Any suggestions to cut the sliminess? Did I cook my veggies too long? Is there another main ingredient I could use besides eggplant (which I love but I know contributed to the slimy texture)? The creaminess was awesome and I loved the smoky spicy flavors and the crunch of the chickpeas, any ideas on how to save this one for the whole family? Thank you! This recipe looks so delicious! I am trying to limit my soy consumption. Can you recommend a good alternative to the tofu called for in the recipe? And if tofu is on the allergen list??? What can you substitute? Seems like a constant problem on vegan cooking sites, sadly. My mouth is watering, so I hope you have a solution.. Thank you . I just made this . And it was great . This recipe was scrumptous!!! Definately a favorite in my house. Easy to do and the crunchy vegs were awesome! I did use almonds instead of the cashews. And the chick peas added just enough solid bulk to each mouthful. Great recipe!! I was thinking I might double this recipe. Would I use a 9×13 pan? How long should I bake it for? As always, thanks for the delicious recipes! Hi Laina! Yes, I think 9×13 would be the best size. You may have to bake it a little longer to make sure it cooks through. Good luck! I doubled the recipe and it’s a good thing I used the full 9×13 pan. My eggplant was a little on the larger rather than medium size. My kitchen smells wonderful and I can’t wait to hear the timer beep. This is another one of those favorites of mine, but I tend to not make it as often because of the extra steps to prepare it. But it is so worth it that I’m going to remember to bake the eggplant ahead of time. The sauce and bread crumbs could be done the day before too. Anyway, I just love your recipes and want to thank you bunches for the beautiful website, the gorgeous pictures and the better than anything scrup-diliicious mouth watering recipes. Hope you are well and your daughter is enjoying and doing well in college! This recipe is my favorite one you have ever written, and I’ve been reading your blog for years. Even my toddler LOVED it. Thank you. Now for the obligatory comments: I used roasted garlic (had a few cloves leftover from your pasta salad recipe actually) and it was so nice I think I will roast garlic with the eggplant next time. Making it as written was perfect for a 9×9 pan but there are so few leftovers next time I will double for a 9×13! For those who have yet to make it who read comments: definitely roast the eggplant beforehand to save prep time, and be liberal with the seasonings. I rarely use full amount of salt (if any), but this needs it. Will also up the cayenne next time. I was trying to find a list of your most popular recipes/tried and tested ones and I couldn’t find anything – did I miss it or is “family favorites” the closest I could get?